Pallet delivery to Italy has never been as easy as it is through National Pallets! Italy has a market economy characterized by high per capital GDP and low unemployment rates. It was the ninth-largest economy in the world and the fourth-largest in Europe in terms of nominal GDP, and the tenth-largest economy in the world and fourth-largest in Europe in terms of PPP. Italy is the world's 6th largest importer/exporter, trading mainly with Germany, France, the USA, the UK, Spain and China. This combined with its high tourism industry mean Italy is a hot spot for imports and exports. We provide a fast and efficient service to all the major towns and cities in Italy. The goods are treated in exactly the same way as they are in the UK with no extra documentation required or customs to pay. You just book the order and let us handle the rest. 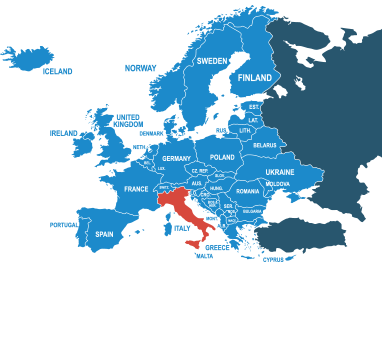 Why not check out all our pallet delivery services from the UK to Italy? Simply request a free instant online pallet quote by using the quick quote option on the right and send a pallet to Italy today! Do I need to deal with customs when shipping a pallet from the UK to Italy? No. As Italy is a member of the European Union, you don’t need to worry about dealing with international customs when shipping your pallet. How much does it cost to send a pallet to Italy from the UK? You can send a standard quarter pallet (up to 250kg) for as little as £122.69 ex VAT. For more information on pallet prices and dimensions, click her to get an instant quote. Orders must be placed before 11am if importing or exporting to Italy to qualify for quoted time scales. Standard delivery time is 6 days, however express 5-day services are also available. We are able to ship the majority of goods to and from Italy, however there are some exclusions, these are listed below. *Orders must be placed before 11am if importing or exporting to Italy to qualify for quoted time scales. Prices quoted are based on quarter pallet size with economy options. Delivery & collection prices subject to VAT.